An ambitious insurance clerk (Lemmon) lends his apartment to executives for their secret romantic meetings, but his sceme backfires when one of the girls (MacLaine) tries to commit sucide in the apartment. With Fred MacMurray, Ray Walston, Edie Adams, David Lewis, Joan Shawlee, Joyce Jameson, and Hope Holiday. Austro-Hungarian Writer/Director Billy Wilder (1906-), who has produced several films, his real name is Samuel Wilder. 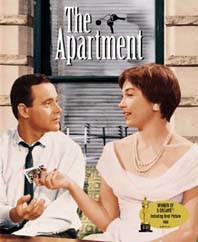 THE LOST WEEKEND (45) and THE APARTMENT (60). His credits also include: THE MAJOR AND THE MINOR, FIVE GRAVES TO CAIRO, DOUBLE INDEMNITY, SUNSET BOULEVARD, STALAG 17, THE SEVEN YEAR ITCH, WITNESS FOR THE PROSECUTION, SOME LIKE IT HOT, ONE TWO THREE, AVANTI, THE FRONT PAGE, and BUDDY BUDDY. Billy Wilder and I.A.L. Diamond received the Story & Screenplay (for the screen) Oscar. While Joseph LaShelle was awarded the Oscar for B&W Cinematography. Daniel Mandell received his Oscar for Editing. Alexander Trauner and Edward G. Boyle received the Art Direction/Set Direction (B&W) Oscar.